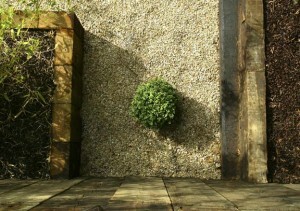 Home / Blog / Landscaping Contract & Garden Design Loughlinstown, Dublin. 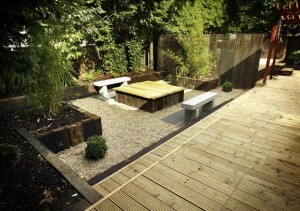 Landscaping Contract & Garden Design Loughlinstown, Dublin. 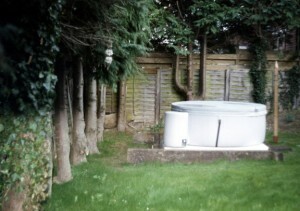 The initial site visit to this contract revealed, the Jacuzzi was already installed, the garden was surrounded by clear stemmed conifers which provided good privacy but created shade and dryness resulting in poor conditions for the lawn and existing planting, the side gate was rotten and in need of replacing. Our landscapers first installed the pergola by the house to frame the view from the kitchen. The pergola was created using pressure treated pine of varying sizes. The pergola was then treated with a red Sadolins preserve. Suitable climbers were planted at the base of each 4″x4″ including Trachleospernun jasminoides, Clematis montana and Lonicera beesiana for scent. The climbers would eventually create a roof of flowers and leaves under which one could walk. The deck was installed using pressure treated 4″x 2″s laid at 18″ cntrs. 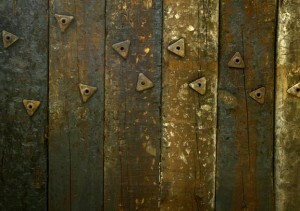 to create the frame onto which 6″x 2″ pressure treated Scandinavian spruce boards were fixed using 4.5mmx80mm screws. 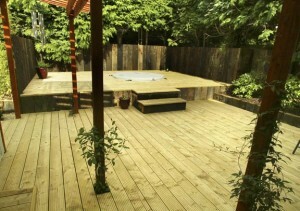 Decking is a good method for creating elevated areas in a garden, it is relatively cheap and easy to install. 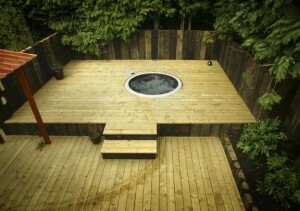 The sleeper wall around the Jacuzzi was created by laying sleepers vertically in an 8″ hole filled with cement to add strength. The deck was used as a guide and the sleepers were connected to the frame. 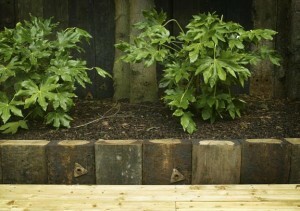 Sleepers were repeated around the garden to create raised beds, steps and a table. 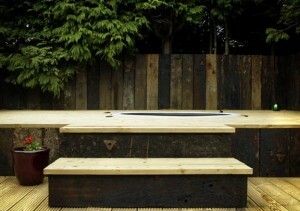 The sunken seating area adjacent to the Jacuzzi area was created using black limestone paving for the granite seats. 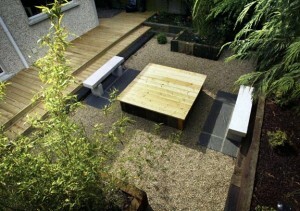 Railway sleepers capped with decking used to create the table for the outdoor chess board and geotextile covered with Ballylusk gravel used to finish the surface underfoot, all in keeping with the low maintenance theme. All the planting beds were covered with geotextile through which the plants were planted. The geotextile was then disguised with 50mm of bark mulch. This double barrier against weeds would considerably reduce any maintenance required for the beds. Suitable plants strong enough to deal with the conditions described were chosen including: Fatsia japonica, Taxus baccata ‘Fastigiata’, Epimedium rubrum, Aucuba japonica, Buxus sempervirens, Eleagnus pungens maculata, Euonymos japonicus, Hypericum calycinum, Lonicera nitida, Phyllostachys aureus, Pachysandra terminalis, Prunus laurocerasus, Skimmia japonica and Sarcococca humilis. Our landscapers then installed the low voltage garden lighting system. This system was the plug and go variety. This system is cheap and easy to install allowing the client to add or move lights in the plugs spaced along the main cable. The lights were place at strategic points to gain maximum effect. Finally the side gate was replaced and the client was very happy with the result. The garden came in within budget and low maintenance was achieved. If you like what you see and require a professional service, please contact Kevin Baumann on 086 8198444.